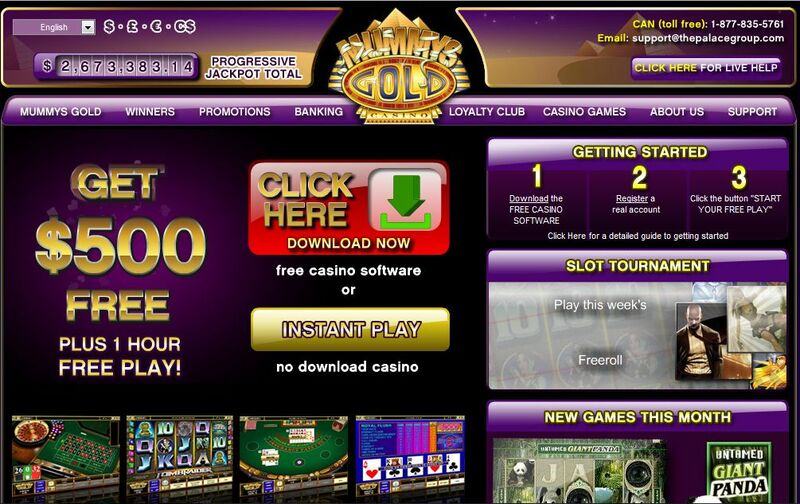 Mummys Gold Casino is part of The Palace Group of online casinos. The casino is licensed by the Lotteries and Gaming Authority of Malta and it displays the eCOGRA seal of approval for safe and fair gaming. The percentage payouts of the casino games are reviewed by independent auditors. The casino offers a good variety of games, 24/7 customer service support and worthwhile bonuses, particularly for their new customers. Mummys Gold Casino is powered by the online casino software provider, Microgaming. The software supports play in multiple languages including English, Italian, French, German, Spanish, Japanese, Norwegian, Danish, Swedish, Finnish, Dutch and Greek. It is available in a downloadable version as well as an instant flash version. Players can choose to play in real money mode or fun mode. You can choose from all of your favorite casino games including a huge variety of blackjack games, American roulette, French roulette, casino war, red dog, craps, poker variations, multiple video poker variations including up to 100 play games, 3 reel slots, 5 reel slots, feature slots, megaspin slots, keno, scratch cards and progressive games. New games are released on a regular basis. New players at Mummys Gold Casino will be awarded with $500 free money plus one hour in which to play. You will get to keep your winnings. This bonus does not require a deposit and poses no risk and if you do not win anything, not to worry, you can still claim the casino’s welcome bonus of $50 free. The Mummys Gold Casino newsletter provides information on additional bonuses and promotions. Currently, you can join the $2,000 Ultimate Poker Contest, the $2,000 Bonus Slot Bonanza or the $2,000 Progressive Table Party. Members of the Mummys Gold Casino loyalty club can also claim additional bonuses and promotions. For every $10 bet that you place at the casino you will earn loyalty points. These points can be accumulated and then redeemed for casino credits. In addition you can win double club points on selected 3 reel progressive slots games and triple club points on April’s new games. There are four tiers of the loyalty club – blue, silver, gold and platinum. The higher you are in the program, the more club points you can earn and therefore the more bonus points you will be awarded. If you have any questions when playing at Mummys Gold Casino you can access the FAQ section on their website. If you do not find the answers you need in this section you can contact the customer service team which is available 24 hours a day, seven days a week. They can be contacted via email, telephone or instant live chat. Players can make deposits into their Mummys Gold Casino account via a number of safe and convenient methods. These include VISA, Master Card, VISA Electron, NETeller, Ukash, Moneybookers, Click2Pay, ClickandBuy, Eco Card, EntroPay, EZIPay, Citadel, UseMyBank, eCheck and InstaDebit. Players can make deposits in US dollars, UK pounds, euros and Canadian dollars.